Firstly, a brief introduction to those of you who might be visiting for the first time. This site is new, there’s not much on it yet, but it has big plans! It all started by chance with a question and a poll on my sewing blog at So Sew Easy. That post was What do you think of advertising on blogs? Readers were kind to vote in my poll to tell me (and all of us) what they thought of advertising and sponsorship. In my follow up post – My blog earnings update – I posted the results of the poll and how my earnings had jumped considerably with the new adverts I had in place. I offered readers a chance to subscribe to a newsletter where I would share what I was learning about advertising, and how to make money from my blog. And a LOT of people subscribed. After 9 newsletters, I decided that these tips could be better placed in a permanent site for easier access – and you are now looking at the result of that at Moms Make Money. Let me be clear – you certainly don’t need to be a Mom, or even a woman – this advice applies to all bloggers, and any blog of any size with any subject can learn how to turn their readers into buyers – in the nicest way, to earn a little extra. So with that intro out of the way, let’s get to business. This is the poll updated to today with all of the votes so far – 159 in total. There are some readers who dislike all forms of blog advertising, some who don’t even notice them and certainly don’t click, and some who either don’t mind at all or quite like them. What a wide spectrum of results. From this, I think that it is pretty plain that sponsored posts are probably not very popular, and advertising in the body of the post itself should be certainly strongly discouraged unless it is highly relevant to the content – such as an affiliate link for a product being used in a particular project. But so long as advertising is generic or targeted to your audience where possible, and tucked away in the sidebars, then most readers don’t have a problem with it being there. That is good news for bloggers and site owners who are hoping to earn a little money from advertising to pay for the costs of their site, and perhaps towards the materials used in their projects and tutorials – the very content that brings value to the readers. So let’s get down to business – why you are all here. My blog earnings. My first blog post on So Sew Easy was early Dec 2012 and I had a bit of a slow start. 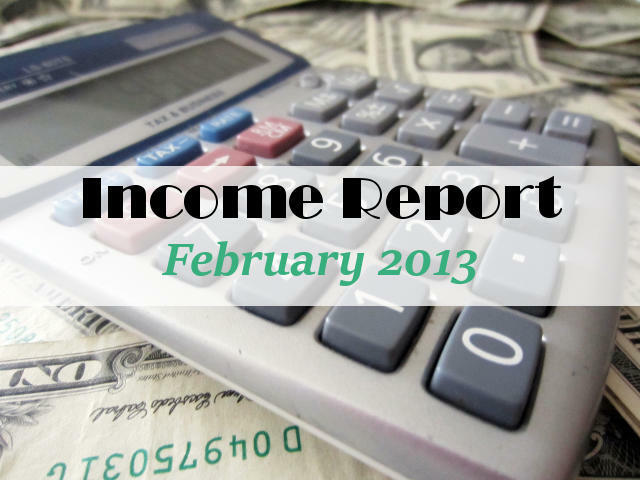 I posted the question about blog advertising on 1st February and revealed that in January I had staggered home with massive advertising earnings of $3.31. But I was hoping to change this with everything I was learning. During January and February I signed up with several affiliate schemes, quite a few advertising agencies, and some of the other more unusual schemes you can use to earn income from your views. I advertised very hard, tried lots and lots of things at once, promoted everywhere – just to see what was possible. It was quite hard work and a steep learning curve, and I certainly wouldn’t plan to devote so much time to this on an ongoing basis – but as an experiment it was very interesting. I think you will agree that is an impressive increase in revenue! And all just from one very new and small niche sewing blog. If I can do it – anyone can do it. I’ll be scaling all that back this month, and concentrating on writing lots of good content both for my little sewing blog and for this one. I have already issued 9 newsletters to date filled with tips and tutorials and have readers setting up their first adverts. I have lots more content planned. Here is the archive of newsletters so far if you want to take a look at what I have already published. And if you would be interested in earning money from your own site, do sign up for the newsletter and I’ll do everything I can to help you earn too. I have some great advice coming up from guest posts from top bloggers and earners and will be sharing about how to bring more traffic to your site, and how to (nicely) sell to them once they arrive. Thanks for reading – if you have any comments or questions, drop me a message below this post and I’ll be sure to answer. a bit of money on the side..
I’m glad you have found it useful and inspiring. If you come up with any topics you would like to see discussed, do let me know. I have student loans coming due soon and am thinking of trying ads for a little extra income to help w/those. We’ll see if I can do it, I’m a total newbie too, but this is inspiring. This is great advice and if I can even make half of that a month, my husband would be ECSTATIC! Wow, that is a lot of spare cash. Congrats! After reading your earlier post, I signed up for a couple of the sites you recommended and have been pleases. My earnings aren’t near yours, but I’ve been accepted to do a few product reviews, which is really fun! Thanks for sharing your knowledge. You are certainly more savvy than I am! Thank you for taking the time to share this information. Hi! I would like to take a moment to thank you A LOT for starting these wonderful series. It’s very very helpful especially because I’m a new blogger too. With the list of affiliates that you provided, I applied to mostly all of them that were available internationally, but got rejected by the one’s I really wanted to work with. But, I will keep on trying. I would also like to ask something, can you recommend the merchants to join on shareasale which are profitable? I’ve very impressed by the affiliate sales! I unfortunately can’t join Amazon affiliates due to the state I live in but clicked through your share a sale link to check that out! Amazon isn’t what it used to be so I don’t think you are missing out on too much. The rate is pretty low and the tracking cookie is now on 24 HOURS! I think they are so successful that they don’t really need referrals anymore so the affiliate program is not so important to them. I’ll be covering more about ShareASale later in the newsletter series. Good luck Melissa. And did I read that right…you are in the Grand Caymans????? Yes indeed I am – where the sun shines everyday – unless we are having a hurricane! You have some very good information. Thanks so much for sharing. We hope you will link it up at our party! I have found your posts very interesting, but I am still unsure whether to use my blog for advertising. I will continue to read and learn. Hi Donna. Glad to hear you have been reading, but of course no one HAS to have any kind of advertising or money making on their website – not all readers lie to see it, so the decision is entirely yours. But at least by having the facts you can make an informed choice. Great post! I’m going to sign up for a few of these today – and joined your newsletter. TFS! I found you today thru the Linky Party at Made In A Day, where I’m #26. I hope you get a chance to stop by my blog and leave a comment, too! I won a $100 bonus from one of my vendors for referring a large number of sales in the month – result! There are occasional schemes to be awarded a bonus for reaching a certain target or placing a new advert for example. It will be interesting to see what my ‘don’t really do very much’ approach brings for March. This is an interesting post. Love the idea of a poll, too. Thanks for sharing at Pinworthy Projects. this is simply very informative! Thanks! Btw, got you from I love fridays link party. Found you thru 504 main and I am so glad I clicked! I am going to read everything you posted later this weekend. I have been thinking of monetizing my blog but assume I need more visits – but it would be nice to learn the ins and outs in anticipation of blog growth! Do look back through the newsletter archive -the site is fairly new but the newsletters are where all of the best content and money-making advice is going to be so far. You can find the archive in the menu under the header. Good to have you on the team! It’s never too early to start. Good to have you here. Thanks for taking the time to comment. Very interesting. I will be reading up on this. This is really interesting – thank you! Thank you for linking up at Fluster’s Creative Muster. I am featuring you tomorrow on Made in a Day! Love this Blog! Great advice! Wow this is so helpful. I bookmarked this. I don’t make money with my blog now, but I’m going to start thinking about it in the near future. Thank you!! And thanks for sharing this and your sewing how-tos on my link party! Hope you can join again this week. Thanks for sharing this info. I am checking out these links. We have had some pretty nice returns from passionfruit ads…but we are always looking for new ways to grow! Thanks for the info – passionfruit ads are new to me but I’ll certainly be checking them out and letting my readers know in due course how I got on. Hi there- May I ask you how you were accepted by Shareasale? I have applied and was denied last week. I am curious to know if you have insight into what they are looking for. Sorry but I don’t know of any tips I can offer – I applied, I was accepted. I think that persistence might pay off, a decline now is not a decline for life. If they send you an email with a few reasons why you might have been rejected, try to correct or improve upon any of the areas they mention and then reapply. I love your site and don’t see any reason why it might be rejected, so just give it another go.